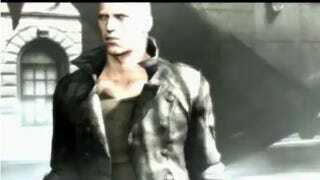 Is Hunk the Third Protagonist of Resident Evil 6? Since last night's trailer debut for the newly-announced Resident Evil 6, fans have been trying to figure out the identity of the third protagonist joining stars Leon Kennedy and Chris Redfield in the ambitious sequel. Could it be Resident Evil's most mysterious character? The Hunk theory makes more sense than several of the others making the internet rounds right now. Some say the character is Steve Burnside, but then Burnside was never a mercenary, and the hair doesn't quite match. Hunk, on the other hand, has done mercenary work, and the hair seems to be a match as well. What hair, you ask? While all of the U.S.S. special agent's in-game appearances have had him masked, reader Chalice (who brought the theory to my attention in the first place) offered up a photo of Hunk unmasked from the Resident Evil 3 epilogue files. It could be a match, if you squint a little. The biggest clues, Chalice says, are in the dialogue. At 2:11 in the video, the character says "I was better off as a mercenary". That fits. It's even a rather witty little nod to Hunk's appearances as a playable character in the Resident Evil Mercenaries game and game modes. And at 2:25 in the video he says "No no. Not me. Just my blood. All the world can have it… ‘long as someone ponies up the dough." Chalice explains that Hunk has long been rumored to be immune to the Umbrella viruses, one of the reasons he's the only member of his various teams that generally survives. If he's immune, the key to saving the world could be in his blood. Makes perfect sense to men, though I must admit my knowledge of Resident Evil lore isn't quite as comprehensive as it should be. Is this a sound theory, or should it be torn apart and fed to the mutated dogs? You decide. One day soon Capcom will prove the theory right or wrong, and you can cheer or weep accordingly.